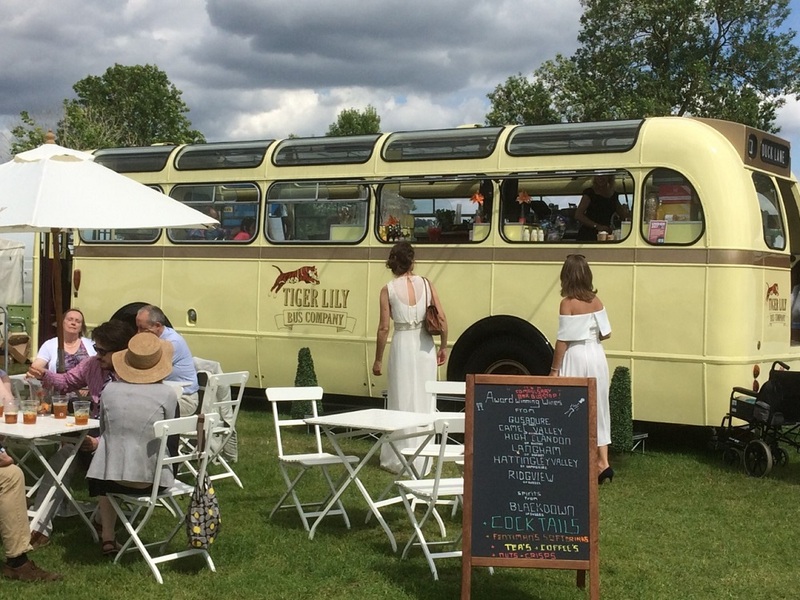 The Tiger Lily Bus Company serves a full selection of award winning wines from personally selected English producers from a beautiful 1954 Leyland Royal Tiger bus. The tiger lily bus company treat every event as unique. You may be an individual wanting to hire them for a special occasion, wedding, anniversary or birthday maybe. Or perhaps you are a large corporate or events company wanting something unique. whatever the occasion they can help make it extra special. They offer a selection of services for you to choose from, but can create a tailor made service just for you. The bus will attend your event with a fully stocked and staffed with award winning english sparkling wines, a selection of sparkling wine cocktails, soft drinks, tea, coffee and snacks such as crisps and nuts and selection of pastiries, cakes and cream teas. The bus will attend your event with a fully stocked and staffed with award winning sparkling wines and a selection of sparkling wine cocktails, soft drinks. snacks such as crisps and nuts. The bus will attend with a selection of english teas and coffee. pastries, cakes and cream teas. This option allows you to pick and choose the elements you would like to include and the company will create a bespoke service just for you. 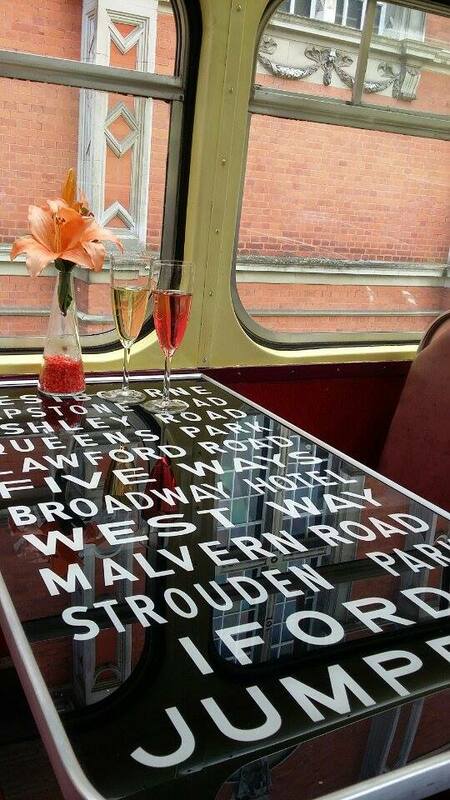 In 2012 Geoff and Marsha had the idea of creating a vintage bus business, uniquely offering english sparkling wines, sparkling wine cocktails and english products from a quintesentially english bus. They came across an advert for a burlingham bodied 1954 leyland royal tiger. she was originally supplied new in ’54 to the bournemouth bus corporation and operated almost all her life in that area. At some point during her service life she appears in two different liveries so was at some stage leased out to other bus companies. She was later returned to bournemouth and eventually retired from service and became part of the bournemouth “heritage” collection. 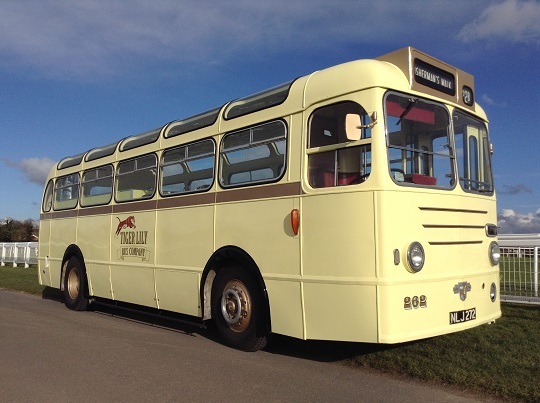 she was purchased from the original owners as part of some 20+ buses sold off by bournemouth heritage collection due to loosing their storage depot for redevelopment. A father and son, who are avid bus enthusiasts had gone along with the intention of buying just a few buses but ended up buying the whole collection to save them from being scrapped. She was taken home to the old r.a.f station at winkleigh in cornwall where she sat outside for several years. although she was started and run regularly she was however open to the elements and was starting to deteriate. so rather than see her rot away she was put up for sale.